Are you a PADI Divemaster looking to continue your diving education? Do you want to take the next step on the PADI career ladder? Give yourself the competitive edge in the job hunt by completing the Instructor Development Course and set yourself apart from your peers. By becoming a PADI Open Water Scuba you will be joining a select few of individuals on our planet who have decided to become dive educators. You have worked hard to reach this level, you are en route to that dream job. So now, you want to be a PADI Open Water Scuba Instructor. Becoming a scuba Instructor means you have to learn how to teach other people, beginners or experienced divers, “How to dive”. Because your student will dive as you taught them, you need to have a lot of knowledge in several topics about scuba diving. That is why Go Pro Cayman offer you this Instructor Development Courses (IDC), an 8 day course especially designed to prepare you for the Instructor Exam (IE), in a relaxed, stress free environment because there is a lot to learn and we want to make sure you will have 100% chances of success. Basically the IDC is training where we will teach you how to use the PADI system to teach in scuba classes, pool, and open water. Thanks to the convenient PADI e-learning, you will be able to study whenever you want on this online course to be ready for your internship. During the IDC we will review several topics related to the written exams taken during the IE. You will take sample exams to identify areas of strength and weakness. You will find the learning enjoyable and very helpful. During the IDC we will also be teaching the EFR Instructors course. As an added bonus, we will include the PADI O2 Instructors specialty. When you will be a PADI Open Water Scuba Instructor, you will be able to teach scuba diving from the Discover Scuba Diving (DSD) to the DiveMaster certification. Have proof of 100 logged dives. Should you have less than 100 dives there will be a minimum charge of 10us per shore dive until you get up to 100 or 60us per 2 tank boat dive, space available. New or used is fine, check out our equipment page for rentals should you not have the necessary equipment. If you do not have your own Scuba diving equipment Don’t Worry, you can rent it from us for only $200US. 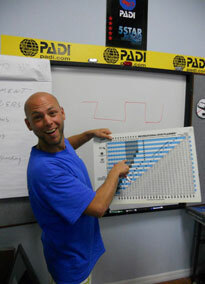 Package price $1300US plus PADI Fees and E-Learning (see below) Duration 8 days + 2 days of Instructor Exam.